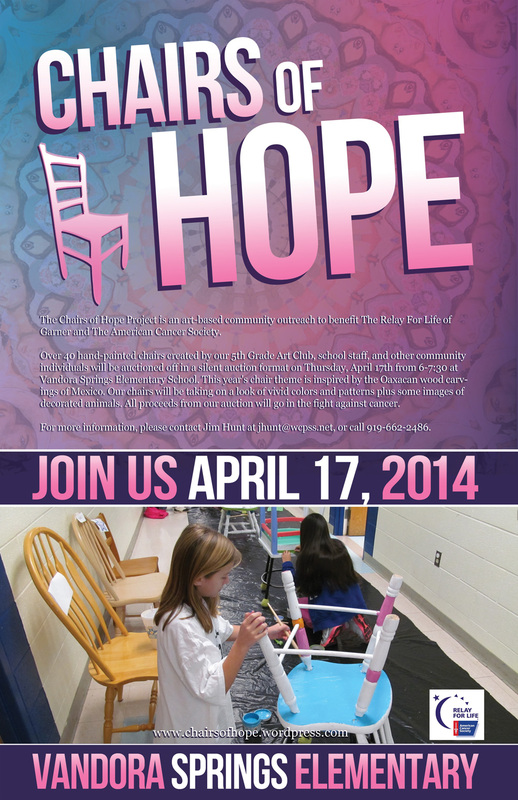 The Chairs of Hope Project is an art-based community outreach to benefit The Relay For Life of Garner and The American Cancer Society. Over 40 hand-painted chairs created by our 5th Grade Art Club, school staff, and other community individuals will be auctioned off in a silent auction format on Thursday, April 17th from 6-7:30 at Vandora Springs Elementary School. This year’s chair theme is inspired by the Oaxacan wood carvings of Mexico. Our chairs will be taking on a look of vivid colors and patterns plus some images of decorated animals. All proceeds from our auction will go in the fight against cancer. For more information, please contact Jim Hunt at jhunt@wcpss.net, or call 919-662-2486.